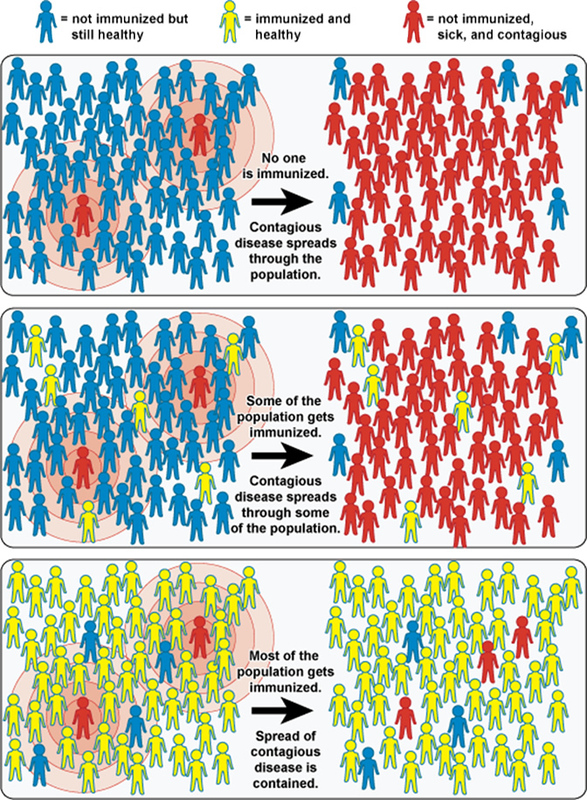 In a nutshell, community or herd immunity rests on the principle of safety in numbers; if a high number of people are immune to a certain disease, either through vaccination or by already having had the disease, then more people in the population are protected from the disease. The percentage of the population which must be immunized in order to achieve herd immunity varies for each disease. For example, we need 93–95% of the population to have measles immunity to prevent an outbreak. Once enough people have immunity (usually 85–95%, depending on the disease), the community is able to protect or shield its vulnerable members. In other words, a high vaccination rate forms a protective barrier against those that do not have disease immunity (like newborns) or people who cannot be vaccinated (like those allergic to certain vaccines or who are immune-compromised). This barrier helps prevent widespread disease outbreaks. So, if measles were to hit a community with 93% or greater of its members immune, the virus would have a hard time spreading to the vulnerable few. 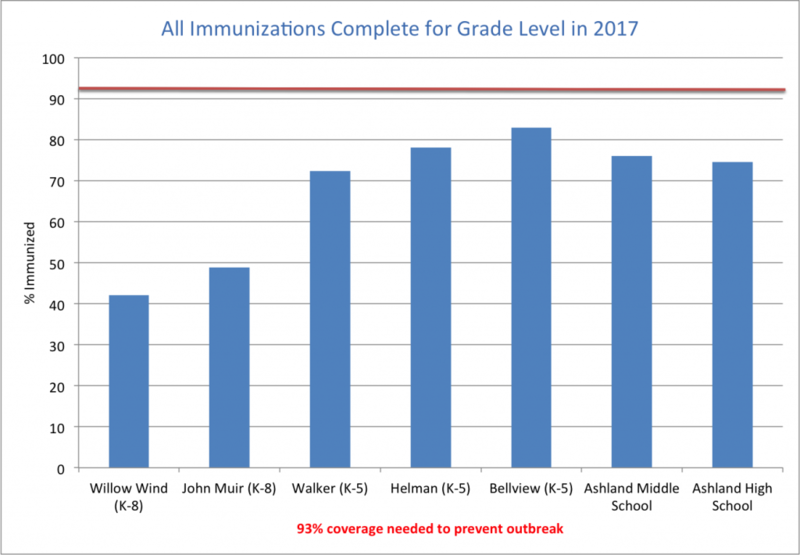 Unfortunately, when immunization rates begin to fall, community immunity breaks down leading to an increase in the number of new cases of disease. We know this to be true of measles in Europe and the UK. California and Washington have had very large outbreaks of pertussis (whooping cough) in the last few years due to waning immunity which has resulted in the death of several infants. So, while part of that is a result of a less effective but safer vaccine, some of the cause of such large outbreaks is reduced community immunity. Who is protected by community immunity? Babies who are too young to be fully immunized. Immune-compromised people. This includes pregnant women and people with cancer or those undergoing treatment for cancer. Vaccinated people who did not develop immunity. Children with medical exemptions to vaccines such as those who are allergic. The principle of community immunity applies to the control of a variety of contagious diseases, including pertussis, influenza, measles, mumps, rotavirus and pneumococcal disease. The herd immunity concept does not apply to tetanus, which is not transmitted person to person. Taken from the National Institute of Allergy and Infectious Diseases (NIAID). In a perfect world the above statement would be true. But we don’t live in that world. Sometimes vaccines don’t stimulate an immune response in people. About 1 or 2 in every 20 people immunized will not have an adequate immune response. That’s an unfortunate fact, but a fact nonetheless. So, what to do about it? The concept behind herd immunity is that enough people are vaccinated to stop the disease in its tracks so that it doesn’t reach the immune-compromised person, the young infant, the elderly, or that poor soul who was vaccinated but did not acquire immunity. The pertussis vaccine is an example of a vaccine that has lower effectiveness (80–90%) than some of the other vaccines, which is why it is so important to have high levels of vaccination to protect infants and the elderly. On the other hand, the measles vaccine is 95% effective for those who get the MMR at 12 months of age or older. After the second dose, 99.7% of those immunized are protected. Herd or community immunity should not be a guilt trip used by vaccine advocates. Community immunity is a gift we can give our communities, our families and ourselves. Ashland is one of the few places in the US where you can’t count on community immunity to protect your child if you choose not to vaccinate. We simply don’t have enough vaccinated children in Ashland to prevent outbreaks of vaccine-preventable diseases. What we do have is lots of precious little babies and older children with leukemia and other immune-compromising conditions who rely on all of us for their protection. Maybe you didn’t immunize your infant because you just weren’t sure vaccines were safe. That child is older now; please reconsider your vaccination decision and get your child and others protected. All adults, especially parents, pregnant women, teachers, health care workers and grandparents, need pertussis boosters to build up our community immunity. Individuals who are immunocompromised are less capable of battling infections because of an immune response that is not properly functioning. Examples of immunocompromised people are those that have HIV or AIDS, are pregnant, or are undergoing chemotherapy or radiation therapy for cancer. Other conditions, such as certain cancers and genetic disorders, can also cause a person to become immunocompromised. Immunocompromised individuals can sometimes be prone to more serious infections and or complications than healthy people. They are also more prone to getting opportunistic infections, which are infections that do not normally afflict healthy individuals. When my daughter was just 15 months old, she contracted Haemophilus influenzae type b (Hib). She was fully vaccinated, ate well and got exposed to a bunch of your everyday germs, thanks to her brothers. Yet there we were, sitting in the hospital, not sure if our baby was going to make it through the night. Julieanna endured several seizures, brain surgery to remove a mass of fluid, sleepless nights in intensive care and endless days attached to a ventilator. When she was finally released from the hospital, she had to relearn all of her motor skills: she couldn’t even eat on her own. How could this have happened? We did the right thing in getting Julieanna vaccinated, but at the time, little did we know that she had an immune disorder that made those vaccines useless. We were suddenly placed at the mercy of the “herd” as some scientists call it. If our family or neighbors fail to get immunized, our daughter’s life could be put in jeopardy yet again. Now with the arrival of H1N1, I have to be even more careful. Each time I take Julieanna to the grocery store, I have to wonder if the cashier who just sneezed on my change is carrying the flu. When a friend comes to visit, I have to wonder if they’ve been exposed. My daughter can’t be vaccinated against H1N1, but yours can. Please, vaccinate yourself and your family against H1N1. Julieanna counts on you to help stop the spread of this disease. Editor’s Note: Brendalee Flint is a working mother of four in Minnesota. Her daughter, Julieanna Metcalf, contracted a rare, life-threatening infectious disease called Hib disease. Since then, Brendalee has been telling her story, in the hopes that it will educate people about the importance of vaccination, especially against Hib. Brendalee and Julieanna’s story can be found on the Vaccinate Your Baby website. We hope you’ll take a moment to read about the very real impact vaccine-preventable diseases still have on our children and loved ones.